This is good news for Catholic Answers and will open up a lot of new possibilities. Christopher Check is now President — a good move. 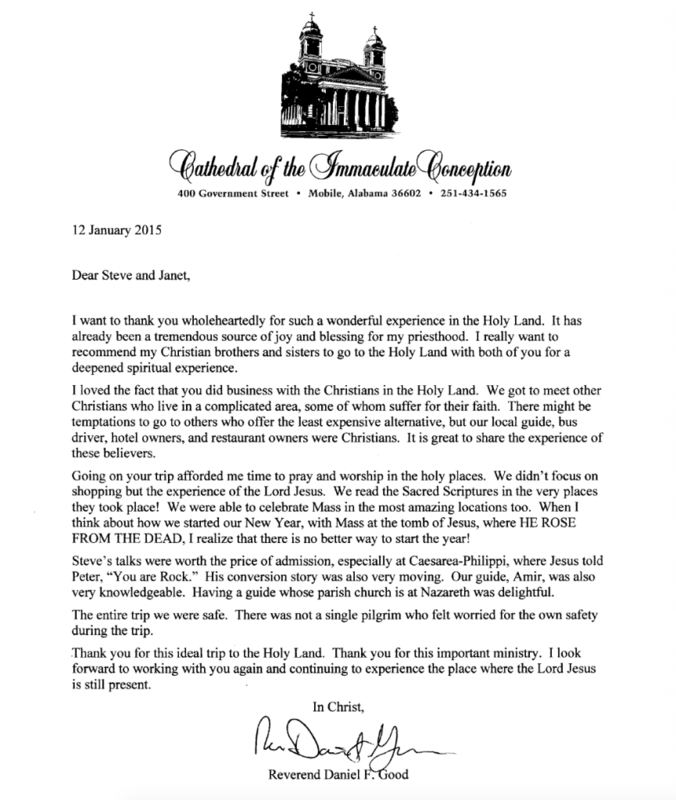 This was an unsolicited letter from our chaplain over the Christmas pilgrimage to the Holy Land. Enjoy! Pope Francis meets with the Grand Mufti of Istanbul Rahmi Yaran during his three day state visit to Turkey last November. Muslims of Khomeini’s ilk don’t care whether or not others think of Islam as peaceful, they only care whether God is on their side. A weak response from the enemy, whether on the battlefield or from the pulpit proves that he is. Appeasement on the part of prelates reinforces the conviction held by many Muslims that Christianity is an inferior religion, not worthy of respect. By the same token, it reinforces the belief that Islam is the superior religion, deserving of special respect. “Allahu akbar” doesn’t mean “let’s dialogue”; it means “God is greater” and its specific meaning to Muslims is that their God is greater than your god. Duke University recently reversed its decision to allow the Muslim Student Association to chant the call to prayer from the massive chapel bell tower, but if the decision had held it would not have been seen as a sign of Duke’s commitment to cultural diversity but as a sign that it is on the road to submission. Duke was founded by Methodist Episcopalians and was originally called Trinity College. The Muslim call to prayer includes the words “Allahu akbar,” and the Allah they call upon is decidedly not a Trinity. Islam, which considers itself to be the best religion on the planet, is also the touchiest religion on the planet. The way you show Islam respect is not by treating it as an equal but by treating it with deference. Not doing or saying anything to offend Muslims might seem like a wise strategy, but once you adopt it, you’re already on a slippery slope. Islam has an insatiable appetite for deference, and there is no end to the things that offend Muslims. The word “Islam,” after all, means submission, and that, ultimately, is how non-Muslims are expected to show respect. Catholics who are worried about offending Islam might note that in Saudi Arabia the mere presence of a Catholic church is considered offensive. Will the wearing of a cross by a Christian student at Duke someday be considered intolerably offensive to the Muslim students? How much of your weekly salary would you be willing to wager against that eventuality? Of course there are many Muslims who are tolerant and open-minded, but in much of the Muslim world they keep their open-mindedness to themselves. What about them? The Church’s current “diplomatic” policy runs the risk of increasing their sense of hopelessness. Islam is an oppressive religious and social system. Many Muslims feel trapped by it. President el-Sisi acknowledged as much when he urged Egypt’s imams not to “remain trapped within this mindset.” When Christian leaders won’t acknowledge the oppression, it reinforces the “trapped” Muslim’s belief that he has nowhere to turn. The problem is compounded when Church leaders insist on expressing their respect for Islam and their solidarity with Islamic religious leaders. Muslims who are disaffected from Islam aren’t likely to convert to another religion which proudly proclaims its commonality with the faith they would love to leave. That’s not to say that Church leaders shouldn’t exercise discretion in what they say. During World War II, Vatican officials understood that saying the wrong thing about the Nazis could result in retaliation against both Jews and Catholics. On the other hand, they did not go out of their way to express their esteem and respect for Nazis and thus risk demoralizing Christians who lived under Nazi control. In order to protect Christians and Jews in Nazi-occupied Europe and later in Communist-controlled Eastern Europe, the Vatican did exercise a degree of diplomatic caution. But that diplomacy was based on an accurate understanding of Nazi and Communist ideology. It’s not at all clear that today’s Church leaders possess a correspondingly clear-eyed understanding of Islamic theology/ideology. The current outreach to Islam seems to be based more on wishful thinking than on fact. And, as Pope Francis himself observed inEvangelii Gaudium, “Ideas disconnected from realities give rise to ineffectual forms of idealism” (232). “Ideas disconnected from realities” is a good way to describe the Church’s Islam policy. That policy does not seem to have done much to prevent persecution of Christians in Muslim lands. How about Catholics who do not live in the danger zones? Catholics who live in the West and rely on the Church for their understanding of Islam can be forgiven if they still remain complacent about the Islamic threat. That’s because there is absolutely nothing in recent official Church statements that would lead them to think that there is anything to worry about. Lumen Gentium? Nostra Aetate? The Catechism of the Catholic Church? Evangelii Gaudium? All discuss Islam, but not in a way that would raise the slightest concern. The Catholic who wonders what to think about Islamic terrorism and then consults his Catechism only to find that “together with us they adore the one, merciful God” will likely conclude that terrorists are distorting and misinterpreting their religion. Confident that the Church has spoken definitively on the matter, he’ll roll over and go back to sleep. Conversely, Catholics who do not rely strictly on the Church for their assessment of Islam are in for a bout of cognitive dissonance. On the one hand, they know what the Church says. On the other hand, they can read the news and note the obvious discrepancy. As time goes by and as car bombings and beheadings occur at more frequent intervals in the West, dissonance is likely to be replaced by disrespect. Church officials who keep repeating the one-sided narrative about “authentic” Islam will lose credibility. Catholics won’t necessarily lose their faith, but it will be sorely tested. At the least, they will stop trusting their bishops on this issue. The trouble with “ideas disconnected from realities” is that they eventually do bump up against realities, and when they do, the bearers of those ideas lose respect. A good case can be made that Catholic leaders should pursue a policy geared toward weakening Muslims’ faith in Islam (a proposition I will discuss in the next installment), but the current policy seems more likely to undermine the faith that Catholics have in their shepherds. It’s ironic that a Catholic can get a better grasp of the Islamic threat by listening to a short speech by President el-Sisi than by listening to a hundred reassuring statements from Catholic bishops.